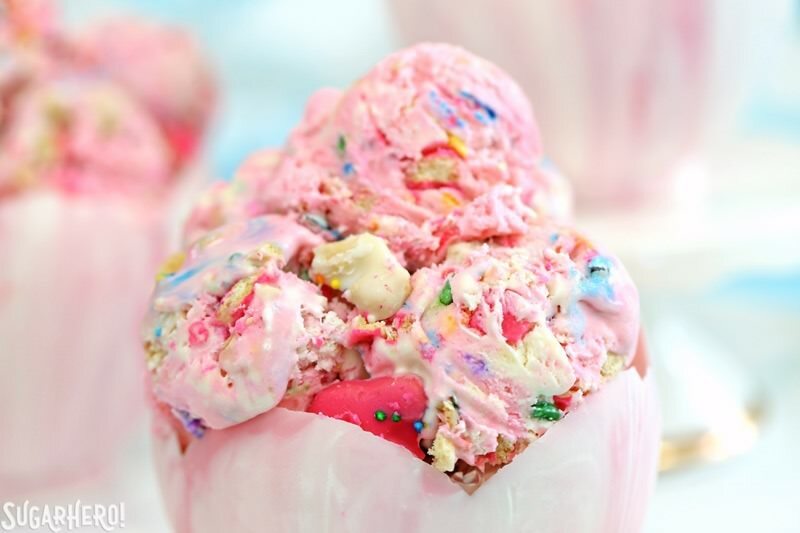 Circus Animal No-Churn Ice Cream is a sweet pink-and-white swirled ice cream, with LOTS of sprinkles and circus animal cookies mixed in! For maximum cuteness, serve them in gorgeous, edible white chocolate tulip bowls! 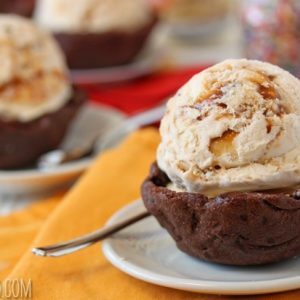 Find full recipes and a video tutorial for the ice cream and the white chocolate bowls below. This post is sponsored by International Delight. This year I’m pleased to partner with them to bring you a series of dessert recipes featuring their products. Watch out, friends, because this Circus Animal No-Churn Ice Cream is a dangerous recipe. Circus animal cookies are already my kryptonite. I don’t know what addictive ingredients they’re putting into those things (um…other than sugar… *innocent whistling*) but somehow, if I get my hands on a bag of those pink and white suckers, the entire thing is gone before I know what’s happened. They are that addicting. 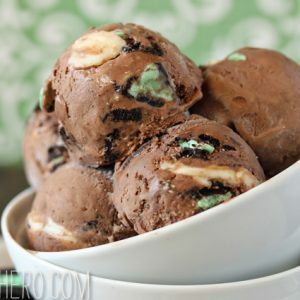 So when you combine THOSE cookies with THIS ice cream recipe, you’re really tempting fate. 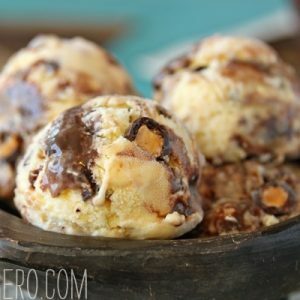 I recommend making this when you know company is coming over, and you’ll have people to help you eat it, otherwise you just might end up gobbling the ice cream out of the container like a feral raccoon raiding the trash can. Not like I’d know anything about that. Ahem. But no need to grumble any longer! With no-churn ice creams, you just mix together a few ingredients, pop that baby into the freezer, and in 4-6 hours, you have a beautiful, luscious, creamy ice cream all ready for you. It’s like magic, only better, because you can eat it. Edible magic, if you will. 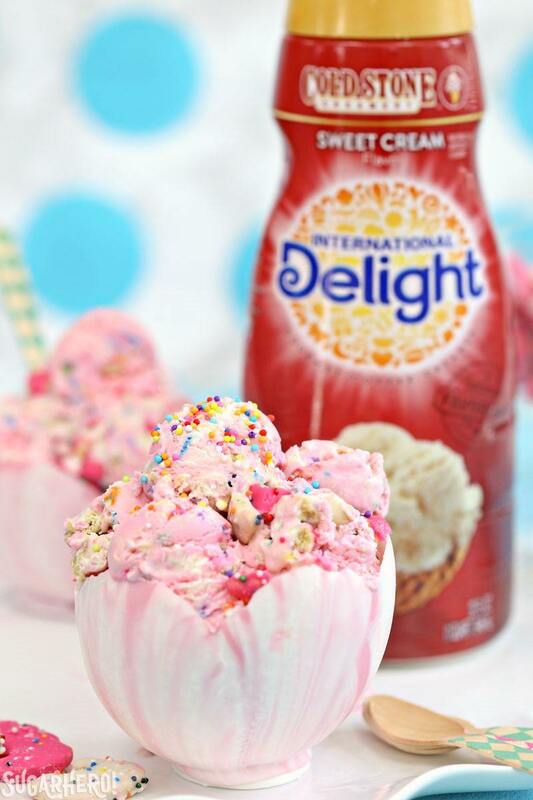 This particular no-churn ice cream is made with International Delight Sweet Cream coffee creamer, which gives it the signature taste of Cold Stone sweet cream ice cream (if you’ve ever had Cold Stone Creamery sweet cream ice cream, then you KNOW that this flavor is good!). So we’ve got the delicious sweet cream taste, thanks to the creamer. We’ve got vanilla extract. We’ve got a bunch of sprinkles, and LOTS of circus animal cookie chunks. Can you see why this ice cream is dangerous yet?? The final touch is to give it pink and white swirls, because it needs to be as cute as it is delicious. WAIT WAIT. 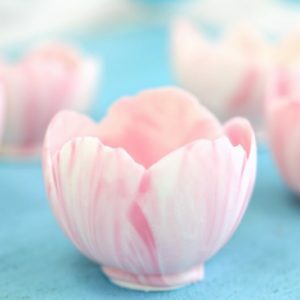 The ACTUAL final touch, if you’re me, is to make these darling edible white chocolate tulip cups, because they are gorgeous and a pretty ice cream deserves an equally pretty serving container. Seriously, don’t you love the pink swirls and scalloped edges? 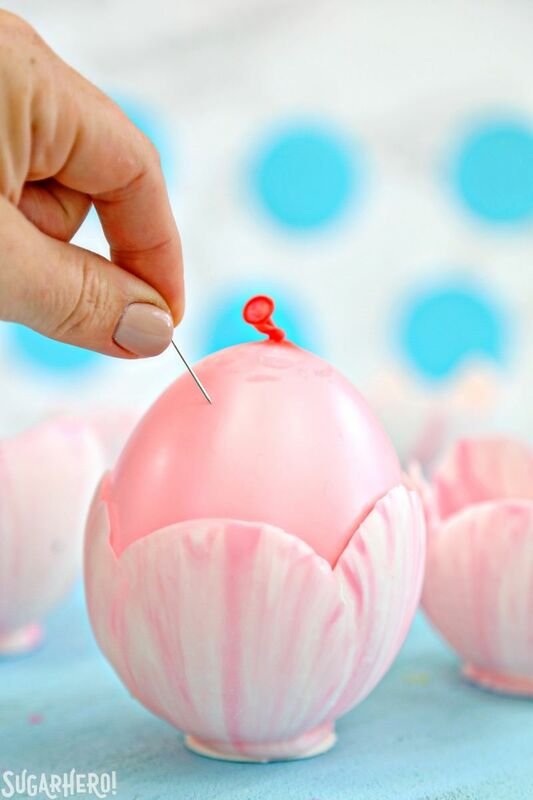 All you need are pink and white candy coating and some water balloons to make them. I’ve shown these in the video down below, because there is a bit of a trick to it, and it’s easier to show than explain. Basically, instead of dipping the balloons in the chocolate, you’ll sort of place one side on top of the chocolate and drag it through, then rotate the balloon and do another side, until you’ve gone all the way around. It might take you a few to get the hang of it, but it’s not difficult, and if you have a birthday party, shower, or any special occasion coming up, these lovelies would fit right in! 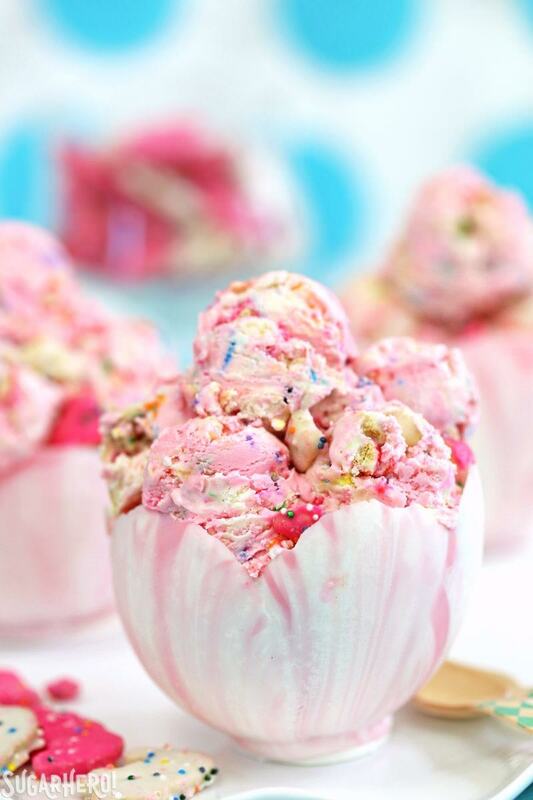 Fill them with mousse, whipped cream, candies, or–my personal favorite–this circus animal ice cream! There is no better way to make it through a blazing hot summer day than a big bowl of this no-churn ice cream. I hope you’ll let me know what you think if you give it a try! 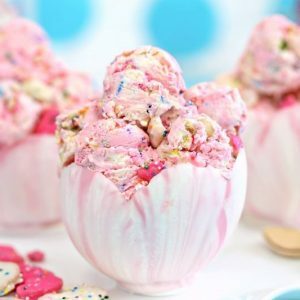 Circus Animal No-Churn Ice Cream is a sweet pink-and-white swirled ice cream, with LOTS of sprinkles and circus animal cookies mixed in! 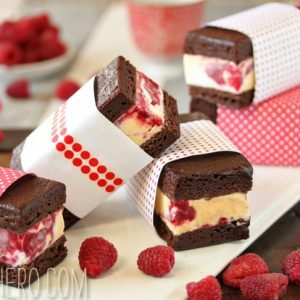 The best part is, you don’t need an ice cream maker to make this treat. For maximum cuteness, serve them in gorgeous, edible white chocolate tulip bowls! Whip the cream to firm peaks. In a separate bowl, combine the sweetened condensed milk, vanilla extract, and International Delight Sweet Cream creamer, and stir well. Gently fold the whipped cream into the milk mixture, working in batches and stirring gently so the cream doesn’t deflate. Once combined, divide the mixture in half and color one half a soft pink color, and leave the other half white. Divide the cookies and sprinkles between the two bowls, reserving a few spoonfuls of each to use as toppings. Gently fold the cookies and sprinkles into both bowls. Take a 6-cup container, and alternate adding scoops of white and pink cream into the container. Swirl a knife through the cream until the colors are mixed up in pretty swirls. Sprinkle the top of the ice cream with the reserved sprinkles and cookie pieces. Freeze the container for 4-6 hours, until very firm. 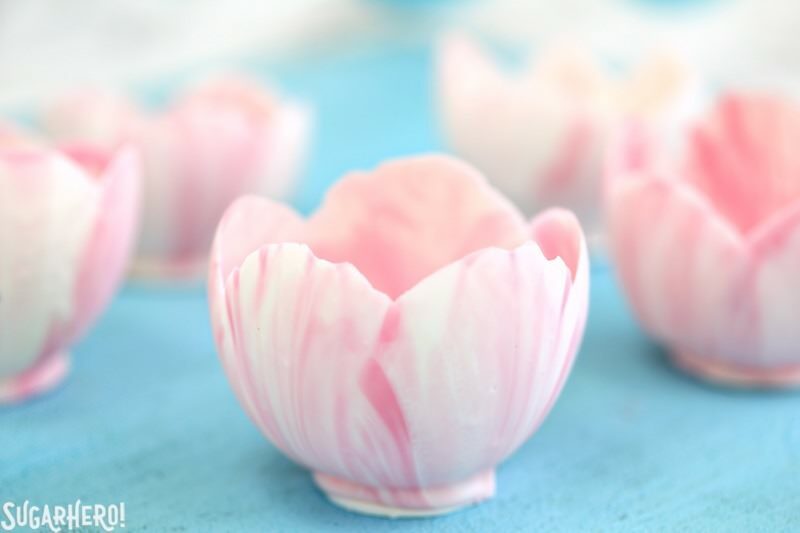 White Chocolate Tulip Bowls are easy to make, and they never fail to impress! 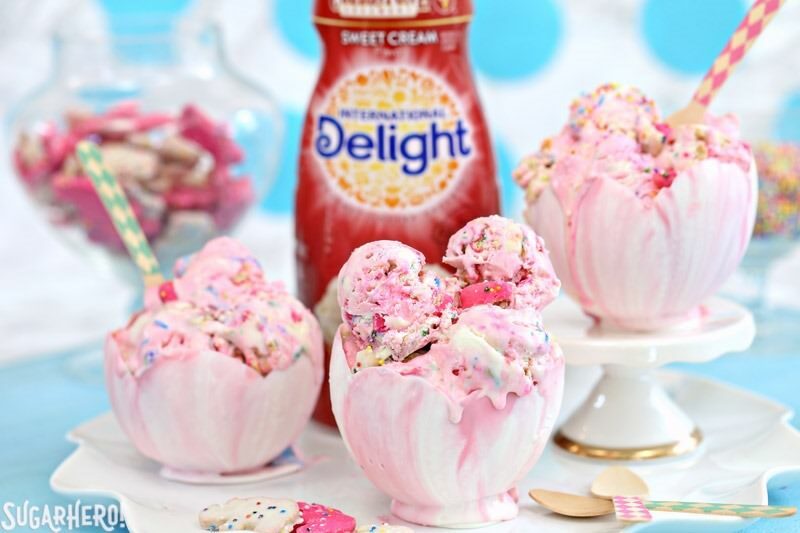 You need just a few ingredients (and a little practice) to make these gorgeous, edible swirled white and pink chocolate bowls with a scalloped edge! Fill them with ice cream, mousse, whipped cream, candies, or anything else you can dream up! Line a baking sheet with parchment or waxed paper. Drop 10 1-inch circles of white coating on the paper, spaced several inches apart, and tap the baking sheet against the counter a few times to level off the circles of chocolate and give them a flat top. These will be the bases for your white chocolate bowls. Blow up the water balloons and tie them off. Drizzle a spoonful of pink coating on top of the melted white coating in a random pattern. Hold a balloon by the top near the knot in one hand, and in the other hand hold the bowl of coating, tilted at an angle toward you. To get visible swirls, you don’t dip the balloon so much as place the side of it in the chocolate and then pull it up. Gently set the side of the balloon in chocolate, so that the chocolate comes about half-way up the side of the balloon in a semi-circle shape. Pull the balloon out of the chocolate, then rotate it a bit, and do a second side, slightly overlapping the first, and creating a scalloped edge on top. Repeat, rotating the balloon, until all of the sides are covered with chocolate. I typically did 5 dips per balloon. Let the excess drip back into the bowl, then gently set the balloon down on one of the white chocolate circles you made. Drizzle another big spoonful of pink coating into the bowl, and repeat with the remaining balloons. If the coating gets too cool to work with, heat it up briefly, in 5-second spurts, just until it is workable again. Once all of the balloons are dipped, refrigerate the tray to set the white chocolate bowls completely. Press against the sides of the balloons, gently, to loosen them from the chocolate bowls, then pop the balloons with a sharp pin and pull out any balloons that cling to the white chocolate inside. 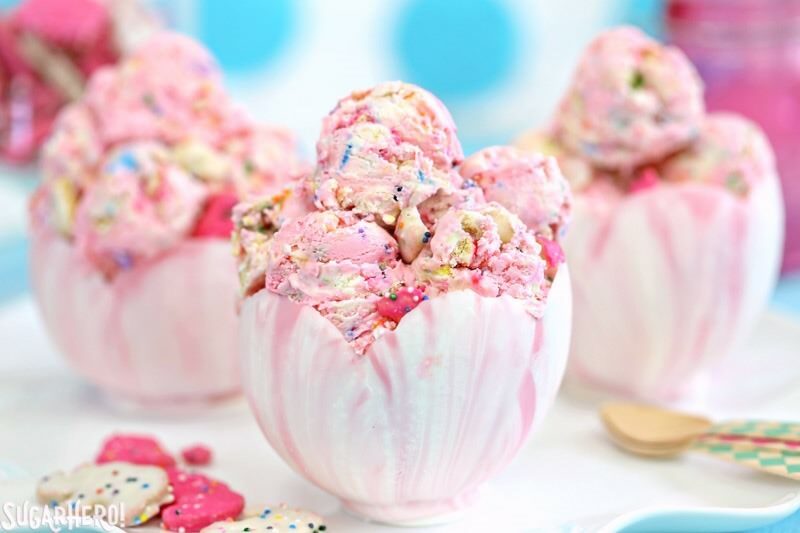 Fill the edible bowls with scoops of Circus Animal No-Churn Ice Cream, and once you’ve eaten the ice cream, devour the bowls! Oh my gosh! These are SO FREAKIN’ cute! I love animal cookies, I eat them by the box so this ice cream is to die for and YES! I can do this with no extra gadgets! 🙂 I’m going to be a happy girl this summer. It’s seriously to die for! I shouldn’t even keep it in my fridge!! Let me know if you make it! I’d love to hear how it goes. Thank you! Oh yeah. Kids love these!! So colorful! Oh, and I love those white chocolate bowls. Super creative! Hi, Elizabeth. I’ve had my ice cream maker for a few years and I prefer custard based recipes. So I’ve passed this recipe by a few times thinking, “Meh, how good could it be with no yolks?” I must say, you’ve opened my mind to no-churn. The texture was really nice and it actually tasted better the longer it sat in the freezer. I didn’t make the bowls this time but I’m chomping at the bit to do them cause they are so CUTE. Thanks again for another fun and delicious recipe. On to the next one! Hi Myra! I’m thrilled to hear that you liked the recipe, and that you’ve been introduced to the magic that is no-churn ice cream. 😀 Let me know how it goes if you give the chocolate bowls a try! We don’t have the sweet cream creamer here. Can we substitute diffrent flavours?? Yes, of course! It’s very flexible and you can use your favorite creamer flavor, or even just swap in heavy cream and add an extract of your choice. These are really nice. Can the chocolate moulds be made in advance and how do you store them? Thanks Angela! They can definitely be made several weeks in advance. Ideally you would keep them at cool room temperature, stored on a baking sheet and loosely covered with plastic wrap or another type of protective cover. If your house is too hot then storing them in the refrigerator would be your next best option–just be aware they might get have some condensation on them after you remove them.